A grey day today so I of course must cut two right worthy classes and go pipping about the Quad in a gorgeously stiff cavalry slicker, whistling "La Golendria" and thinking mightily of other climes. It pays to travel, you also pay to travel. A few lines more. Praise be unto Allah! Will Lady Louise appear in person and explain the pen and ink art work at the bottom of the paiiige. 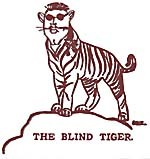 Neither is ut a Chino Tiger, blind or not. "After all--Being graceful is not an art cultivated by large youths."